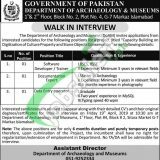 Here on January 30, 2019, you’ll have Department of Archaeology and Museums Pakistan Jobs 2019 Latest Advertisement. Jobs in Department of Archaeology and Museums Pakistan National History and Literary Heritage Division are available and it is looking for highly educated, very experienced, hardworking and well disciplined to step forward and apply confidently for the following positions. Jobs in the Department of Archaeology and Museums Islamabad are on Open Merit Quota basis such as (Software Developer/Trainer, Documentation Expert, Data Entry Operator) for the project name as "Capacity Building on Digitization of Culture Property and Stone Objects Conservation". Appointment of these positions will be initially on a contract basis which is further extendable on satisfactory performance of the individual. So, those candidates who are looking to apply for these positions need to read the following qualification/experience mentioned in the following image and according to the criteria, Masters/Bachelors degree holders can apply. So, only eligible candidates should apply as per the following how to apply procedure given below. Applicants are required to appear for interview along with detailed CV, and their original documents to the following address given below. Interviews will be held at 1st floor, Block No. 2, Plot No. 4, Sitara Market, G-7 Markaz, Islamabad. Interviews date is April 19, 2019. No TA/DA will be paid for the interview. Stay in touch with us and keep visiting our site JobsAlert.pk for more jobs. Interview Date: April 19, 2019. Venue: 1st floor, Block No. 2, Plot No. 4, Sitara Market, G-7 Markaz, Islamabad.